Northern Lights Soap | £4.25 // I was a bit disappointed with this soap as from the description I was expecting a really strong citrus and lime scent with a hint of pine from the cypress oil. Instead it just smells a bit soap to me. I'll still use it but had I smelt it in a shop then I wouldn't have bought it. B Electro Shower Gel | £11 // This shower gel has a consistency like no other I've tried. It's incredibly thick that it sort of reminds me of the shower jellies from Lush. The scent of B Electro reminds me of sherbet but there's also grapefruit, rose and fennel. Just look at the colour of it though! Although it's much brighter and fluorescent in person. Sparkler Bath Bomb | £3.95 // If you like the Rose Jam Shower Gel from the Christmas collection then you'll love this bath bomb. Unfortunately it was limited edition last year for Bonfire Night. 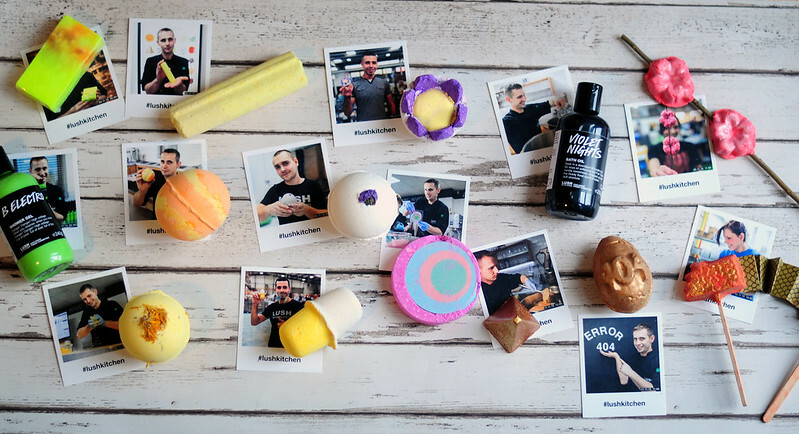 The only place you'll find this now is in the Kitchen unless Lush bring it back one year. Luckily I was able to buy one. This is also one of the more fragile bath bombs and it doesn't travel very well. I bought two and both arrived in one piece which I was pleased about. 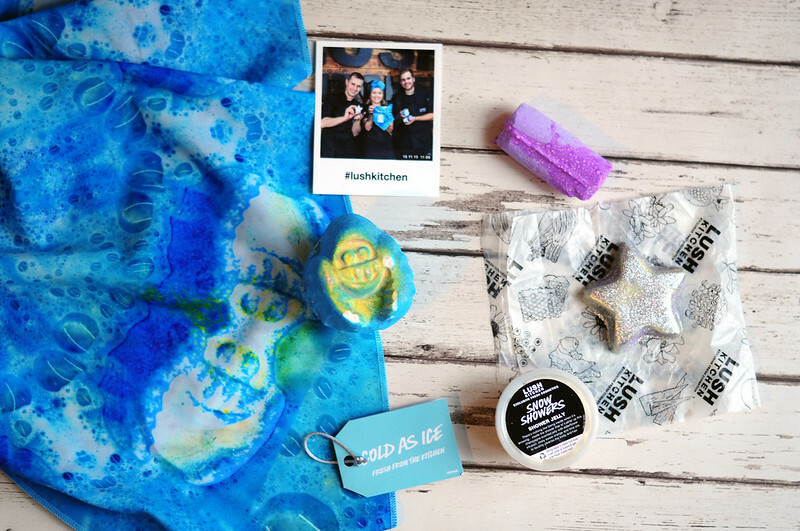 The Northern Lights Bath Bomb from the Cold As Ice Gift Set which is a similar design did not travel so well! The Enchanter Bath Bomb | £4.25 // This is another one I've heard so many people raving about but I haven't tried it before. It looks quite plain from the outside but I believe it holds a few secrets inside. I love the lime, neroli and olibanum scent of this one. Still Life Bath Bomb | £3.95 // This was a last minute addition to an order and I'm so glad I added it. As you can probably guess by the name, this bath bomb is inspired by Van Gogh's Sunflower painting. I thought this might be a bit too floral for my liking but I actually love it. It's not too over the top but actually quite a fresh floral scent. Sacred Lotus Bath Bomb | £3.95 // I knew I had to try this bath bomb when the Oxford Street store first opened but I knew it wouldn't travel well. I took a risk and ordered one when it was released in the Kitchen and amazingly it arrived in one piece! I like the jasmine and neroli scent but it isn't one of my favourites. Now I've tried it, I'm not too sad that I can't buy it so easily. I do love how this looks in the bath though! Ylang Song Bath Bomb | £3.95 // This has quite a subtle fragrance compared to some other Lush products and it makes a nice change. It's a mix of ylang ylang, rose and neroli and is packed full of flower petals inside. Cyanide Pill Bath Bomb | £3.50 // This has been released a couple of times I think but I am yet to try it. This is probably my favourite out of all of them, I really love the scent! It has a lemon, cedarwood, rosewood and almond scent and is another one that looks quite plain on the outside but just wait till you see it fizz away in the water. It reminds me a bit of another favourite, Snowcake Soap which shares the almond scent. Granny Takes A Dip Bath Bomb | £3.50 // This isn't a new bath bomb to me as it was available from the permanent range last year but was discontinued as it took so long to make. Mine did arrive quite crumbly so I used it straight away as I knew it would only carry on crumbling. It has a ginger, pepper and lemon scent which makes it a bit different. 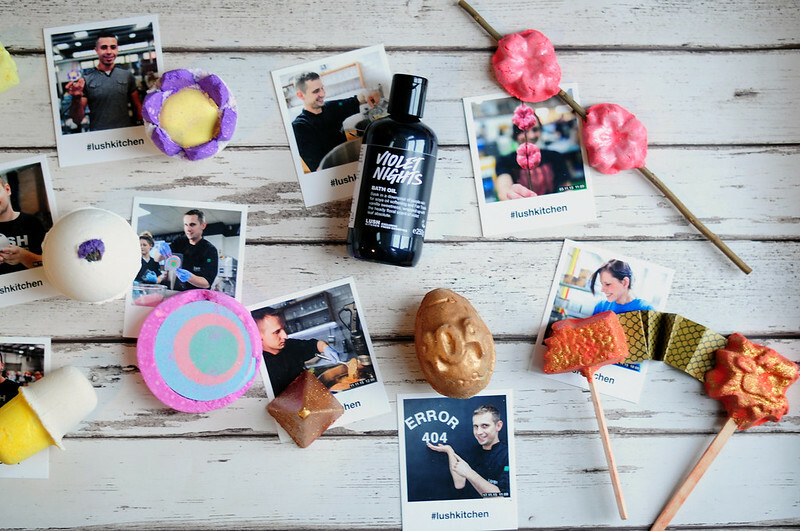 Violet Nights Bath Oil | £14.25 // I've never heard of Lush selling a bath oil in a bottle before so I knew I had to try it. From reading other reviews, I believe this emulsifies once added to water and creates an incredibly moisturising bath. The scent is a mix of sandalwood, a favourite of mine, and violet with a hint of vanilla, a nice combination. This is also one that features in quite a few of the bath cocktails I want to try so I'm really glad it was part of the Kitchen this month. Karma Bath Melt | £4.75 // I cannot wait to see what this gold pyramid looks like in the water! I'm going to use it with the Karma Bubble Bar and think it'll look amazing with the purple bubble water. I love the karma scent which is a mix of orange and patchouli. Error 404 Bath Bomb | £4.04 // I've heard so much about this bath bomb and missed out on it being given away for free on the website if you came across it's page a couple of years ago. Luckily I managed to grab a few when it was in the Kitchen this month and it's quickly become one of my favourites. It's a real showstopper in the bath and spins and fizzes away really quickly. I also love the colour combinations. The scent is a mix of geranium and orange. Cherry Blossom Reusable Bubble Bar | £5.95 // This reusable bubble bar smells good enough to eat! It reminds me of a macaron thanks to the almonds. I also love the design of this one and think it's cleverly done. 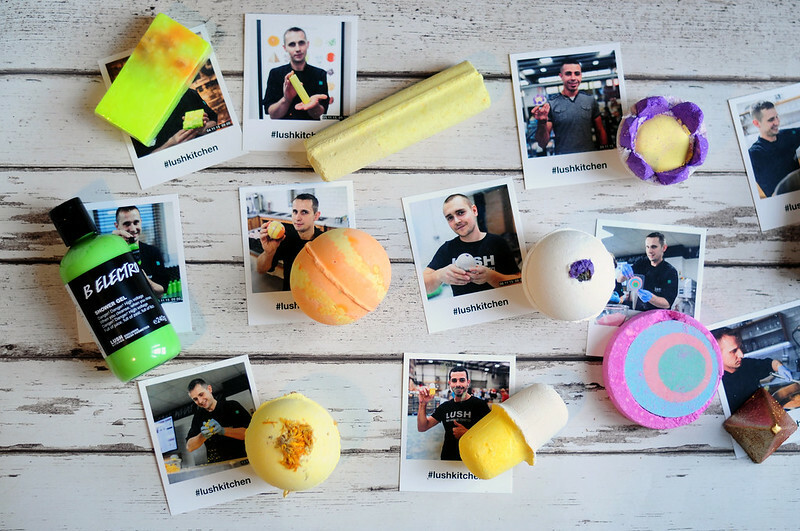 Little Dragon Reusable Bubble Bar | £5.95 // I really don't like the scent of this one although I can't pin point what it is and have given this away to my mum. The scent is cinnamon and ginger which I would normally love but to me this smells a bit too soapy and I really don't like it. It looks cute though and I really like the reusable bubbles bar but this just isn't for me. Cold As Ice Gift Set £24.95 // I told myself I wasn't going to buy this gift set as the only product I really wanted to try was the Abombinaball Bath Bomb but then I started reading reviews of the other products and completely got sucked into buying it. As you can see there's only half of the Northern Lights Bath Bomb as it arrived smashed up which I wasn't too happy about. Lush customer service was great about it though and I've got a replacement parcel on it's way to me although the bath bomb had already sold out so I'm not getting a replacement NL. The gift box was wrapped in this knot wrap which is actually the Abombinaball Bath Bomb in water although in some parts it looks quite abstract. The knot wrap is also made up of recycled plastic bottles which is incredible. 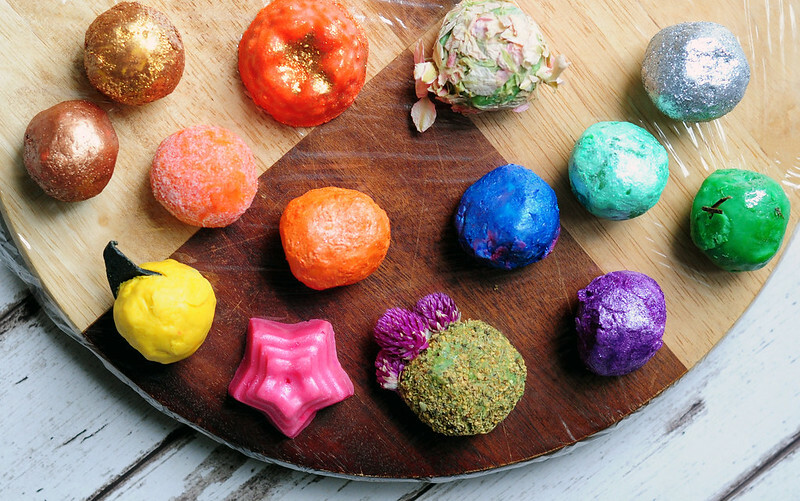 Abombinaball Bath Bomb // I think this is the best looking bath bomb ever! Just look at it! It also smells amazing and I love the mix of peppermint, orange and vanilla. It's such a unique scent and the peppermint goes so well with the whole snow/ice theme. This is the sort of scent I had hoped the Frozen Bath Bomb smelt like. I cannot wait to see what it looks like when it fizzes away in the bath. Star Light Star Bright Bath Melt // I loved this lime and ginger bath melt when it was brought out last Christmas so I'm happy to have another one to use. The outside of this is covered in shimmer though and it gets everywhere! I usually cut this into three as it's actually quite big for a bath melt. Northern Lights Bath Bomb // This is one of the few products from the Kitchen that I've actually tried before as I think it was brought out last year or even the year before last around bonfire night along with Sparkler. This has a very strong jasmine scent and I feel like you're either going to love it or hate it. Once in the bath though it becomes a bit more subtle and you can start to smell the ylang-ylang as well. Unfortunately I won't be able to experience this one properly since it came broken so I'm going to use it in a Lush cocktail and mix it with a few other products. Snowshowers Shower Jelly // I'd never heard to Snowshowers before reading up on this gift set but it's one quite a lot of people have raved about. It has a champagne scent along with elderflower, orange and lime. I haven't tried any of the bath oils yet so I'm just going to include the Lush descriptions. These are currently only available in the Oxford Street store although they're still all online at the moment. There's a few that I'd like to buy on a regular basis so I hope they'll be available online or in other stores at some point. Since these are extremely moisturising and I tend to mix the bath oils with other products, I've been cutting them in half to get more than once use out of them. Double Vitality was also missing from the order so that's on it's way to me as I type this. I am most excited about trying Furze (one with purple flowers) and Oil On Troubled Water. The Sun Bath Oil | £2 // Imagine the sun as a huge orange lollipop. Transport yourself to sunnier climes and happier times by releasing Brazilian orange oil into the bath. Put a smile on your face. When days, or baths, seem grey, let the outer bronze layer of this bath oil unfurl to reveal bright orange colour. Soak up the Sun. Ginger Bath Oil | £2 // Some things just go together: Ginger Rogers and Fred Astaire, organic cocoa butter and shea butter, jojoba and coconut oil, gold and glimmer. For the perfect carefree partner in the bath, this glittering bath oil mixes them all up (unfortunately, there's no tap dancers inside). Get in the swing of things and watch as this sunny orb bobs across the water putting on a show. Shall we dance? Cloak Of Invisibility Bath Oil | £2 // If you just feel like disappearing for a little while, slip into the bath with this seductively relaxing bath oil and cloak yourself in floral jasmine absolute and mood-brightening ylang ylang oil. Before the doorbell rings, the dog barks or the children shout, pulling you out of your calm oasis and back into reality, enjoy nourishing Majorcan almond oil hydration... Who said that! Happy Thoughts Bath Oil | £2 // Happy thoughts, keep thinking happy thoughts. Think about things you'd like to do. You gotta have a dream. If you don't have a dream, how you gonna have a dream come true? Think about a bath oil softening the water, scented like an orange on a grove. Think about bright pink colouring the skies, spreading all the cheer it can. Or better yet, just experience it with this uplifting Brazilian orange oil and neroli blend. Shark Infested Custard Bath Oil | £2 // What's yellow and dangerous? Not this! There's something vanilla-scented in the water and it's on its way to nourish skin with extra virgin coconut oil, shea and coconut butter. Don't be scared of this bath oil, descend in to the deliciously scented depths. Hold this vanilla-scented melt by its melon paper fin and dive it into the bath waters. Dun dun... Dun dun... You're going to need a bigger bath. Orange Blossom Bath Oil | £2 // Get on your bike and cycle through sun-dappled orange groves. Oh wait, you're in the bath? Well, you'll have to soak in the next best thing instead. Bursting with organic shea butter from the Ojoba Women's Shea Co-operative in Ghana and rosewood oil sourced from our Amazonian rainforest concession in Peru, it's not hard to imagine you're bathing in sunnier climes! I Am A Radiant Being Bath Oil | £2 // An enlightening blend of oils and butters allows you to feel like the star that you are! Make this your mantra, embrace positive thoughts and relax in lustrous coconut and jojoba oil. Visit the age of enlightenment as you drop this in the bath and allow your senses to consider floral geranium, rose and lemon oils in shades of evening pink. Flowers Barrow Bath Oil | £2 // Imagine the scene. You're standing atop of Flower's Barrow, an Iron Age hillfort looking out across the captivating bay of Worbarrow on the Dorset coastline. Your barrow will be taken over by the Romans when they arrive, but the only roman in this quintessentially English bath oil is mood-brightening roman chamomile oil. Together with geranium oil and black currant absolute, bathing with this delphinium petal-rolled beauty will recreate the fresh floral airs of the English countryside. Oil On Troubled Water Bath Oil | £2 // Calm the storm as you unwind amongst clouds of mint and oakwood; you can almost smell the weather turning. Amidst turbulent monsoons stood he. Darkness behind, a mirage ahead. Rippling clouds, peppermint airs swirl, Eye of the storm, oakwood awaiting. Through the abyss he walks, bath unclear, purple swell. With weather turning, The mind wakes. Furze Bath Oil | £2 // It is a truth universally acknowledged, that a person in possession of an inviting bath, must be in want of a bath oil. However little known the feelings or views of such a person, it seems nonsensical to suggest they wouldn't delight in the scent of meadows covered in gorse bushes. This quintessentially English bath oil looks prickly at first (it's pressed with three amaranth flowers and rolled in elderflower after all), but when its shell blooms away it's a softie at heart. Delight Bath Oil | £2 // I delight in the security that is a constant in my life. I consciously create my own bath with bright, zesty lime and spicy black pepper oils. Today is a treat for my skin as it enjoys nourishing 100% traceable Fair Trade organic cocoa butter. I release this intriguing silver bath oil to become a magnet, attracting comfort and content. Lime Pastille Bath Oil | £2 // Whereas the beautiful is limited, the lime is limitless. The mind in the presence of the lime is lifted by citrusy fragrance and entranced by lustrous green waters that burst with hydrating extra virgin coconut oil. For fruit salad fragrance that's simply the zest, it's also brimming with lemon oil. Put the lime with the coconut and mix it all up (your bathtimes that is). Johnny Appleseed Bath Oil | £2 // We don't want to put ideas in your head, so we'll just plant a seed. Why not pop this fruity green treat in the bath? An apple a day will send troubles away as you sow uplifting neroli, bright lemon and Brazilian orange oils into the water. Make it the apple of your eye. Monsieur Gustave Bath Oil | £2 // Without question, without fail, always and invariably, exceedingly lovely, Monsieur Gustave is on hand when you’re looking for a bath that’s a little more civilised. Suave and soothing, lavender and rose oils create an atmosphere of sophistication and calm, then a dash of tobacco absolute entices the senses with an air of classic grandeur. Check out this Monsieur in the bath; you'll never want your stay to end. Double Vitality Bath Oil | £2 // Zing, zing, zing went my heartstrings, from the moment I saw it I fell. Let this pink star sandwich go in the bath and watch it spring to life, painting a sky of whimsical pinks with the scents of refreshing peppermint and bright, uplifting lemon; feel the double dose of vitality. As you do, organic shea butter will richly cover the body to hydrate deeply.